More people are familiar with King John of England than probably realize. 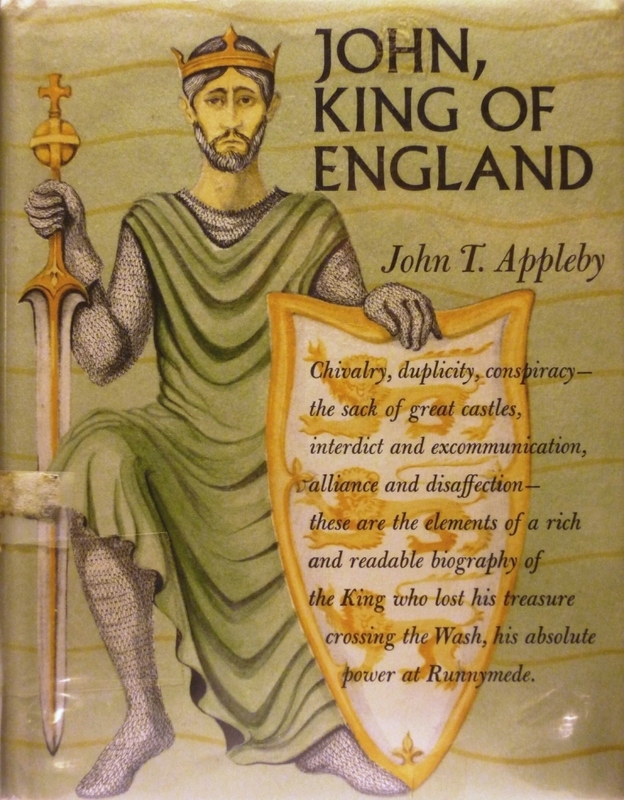 My second half-book for 2013 – John, King of England by John T. Appleby – was an adventure to read because it was a reference book for my novel-in-progress that I had to continue if I wanted the “in progress” bit to remain true. Yet is was also so dense with historical information, it took forever for me to get through it. No word of lie, I renewed this book from the library four times for three weeks at a time. It was also the book that quite decisively taught me how not to go about writing a work of historical fiction, such as I currently am. But that’s the topic of a whoooole other blog post. Despite how long it took to read John, King of England, it was very enjoyable. It was written in a dry, witty style typically attributed to British humour. For a long time, I assumed the author, John T. Appleby (who died in 1974), was British, only to discover that he was born in Fayetteville, Arkansas, was a Harvard graduate, and at the time of the book’s publication (1959) lived in Washington, D.C. He waged civil war against his barons and unleashed bloodthirsty mercenaries upon the English countryside after being forced to sign the infamous and influential Great Charter (Magna Carta) at Runnymede. [W]e in these present days have seen such depths of human depravity that we cannot consider [John] as the unrelieved villain that he once appeared to be…. [W] hen we consider what men with absolute power have done in later days we are forced to almost admire John’s restraint. (p. 275). Recall that this book was published in 1959. The people of 13th-century England believed they were witnessing in John a new limit to the evil of mankind. Appleby, in 1959, seemed to , believe the exact same thing of the despots of his day. It is now 2013. The world has seen plenty new heights of evil in the intervening 54 years. Does a limit to such even exist? This entry was posted in Adventures in Reading, Be it Resolved, Post series, Preoccupied and tagged Books, Novel, Novel writing, Reading, Research, Writing. Bookmark the permalink. How frighteningly true your conclusion is Janna 😦 So looking forward to reading your story but can you sort of pretend about Robin Hood, even if it blows your credibility out of the water? John T. Appleby had no idea…. Hey, I share at least one of the failings on that list! Oh well. I like to think flaws are part of my charm. In regard to the closing portion… as ugly as things can get in the world, it’s slowly becoming a better place. Behaviors that were once considered standard practice in a leader have come to be viewed as heinous over the years, and ordinary people have unprecedented freedom. It remains important to fight oppression, but human rights have improved dramatically. Cheer up! Hey, I share at least one of the failings on that list!